For those who don't, it was Apple's first crack at mobile computing; that is, if you didn't count the "luggability" of the original compact desktop Macs, which had almost the same weight as the Portable. Actually, the late Jef Raskin's original conception of the Macintosh was that it should be a portable machine. As Apple historian Owen W. Linzmeyer notes in Apple Confidential 2.0, "Raskin expected people to grow so attached to their Macs that they would never want to leave home without them, so portability was a key concern. He envisioned a weight just under 20 pounds and an internal battery providing up to two hours of operation." I expect Raskin was thrilled when the PowerBook came along, since from the first it pretty much met or exceeded these criteria. I've long maintained that the PowerBook (as well as the iBook) is "the logical Mac" - and it's gratifying to hear that the "Father of the Mac" also thought so from the get-go. Returning to the main topic here: Before there was a PowerBook, Apple built another portable Mac called, logically enough, the Mac Portable. In February 1991, the Mac Portable was upgraded with a backlit display, more RAM, and a lower price. At 15.8 pounds, the Mac Portable needed its carry-handle, but its size and weight made things like that long-lasting battery (which alone weighed more than 2 lb.) and use of a standard (cheaper) 3.5" hard drive possible. Another sensible innovation was use of a standard 9V "transistor radio" battery for PRAM. 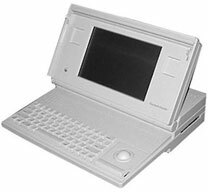 The smaller, half-the-weight-or-less PowerBooks replaced the Mac Portable in October 1991 were more convenient for serious road warriors, but more compromised specification-wise compared with desktop machines. I think it would be great if Apple came out with a big laptop in this general vein, more a portable desktop substitute than a road-warrioring machine. "What about Apple's 17" notebooks?" you might ask. Well, they're nice. I have a 17" PowerBook, and I love it, and the 17" MacBook Pro is my pick for most desirable among Apple's current notebook offerings. But it's compromised as a true desktop substitute portable by the absurdly thin form factor, which to a considerable degree negates the advantage of having a large footprint. The 17 incher isn't any more expandable or upgradable or easy to work on than the 15" PowerBook. There is also plenty of room for a full 105-key extended keyboard, but instead the Big 'Book uses the same keyboard as its 15" siblings, leaving huge expanses of empty plain metal surface at either side. There are some big PC laptops with up to 19" displays, and even one or two (more to come soon, it seems) with quad-core processors, but Apple has thus far chosen not to go this route. Raw bulk and weight are not the point, nor is just a large screen size. What I would dearly love to see is a jumbo PowerBook that would restore and enhance the connectability and expandability standard that was set by the WallStreet G3 Series PowerBook back in 1998, with two PC card slots, two expansion bays (although even one would be a quantum improvement on the status quo), easy facility of opening up to perform component upgrades and repairs, and a motherboard design that facilitated both processor and video accelerator upgrades. A larger machine should also theoretically be easier and more efficient to cool. A detachable display and keyboard for better ergonomics in desktop use would also be cool. I'll even stick my neck out a little farther and suggest that Apple might consider replacing the iMac with this type of portable machine. From time to time I've been nearly convinced that an iMac would make the best sense and certainly be the best value for the money power-wise as a workstation, but the biggest sticking point for me is the lack of battery power. It isn't so much that I use my main production Mac in portable mode very often (although it's very convenient at times to be able to) but rather that I prefer to be able to keep computing through power interruptions, which are not uncommon where I live, and I really detest losing data because of even a short power interruption. Perhaps even cooler, since I'm letting my imagination off its leash a bit, would be a portable machine based on another abandoned Apple great idea - the PowerBook Duo. The computer I envision would be totally modular, with a basic CPU core unit (containing the CPU, hard drive, RAM, and an expansion bus for docking) that could serve as either the CPU module of a desktop iMac replacement that would be available without a battery and which could be sold with a built-in (detachable) monitor, or "headless" to be used with an external display of the customer's choice. Ease of access to internal components and upgrade slots would be a priority. The same CPU unit would also be able to form the basis of a portable/big laptop with a built-in keyboard and trackpad and a battery in one or both of the expansion bays. And, of course, it would be processor upgradable and ideally include PCI and AGP expansion slots, an ExpressCard 54 slot or two, removable device expansion bays, maybe a standard 3.5" hard drive (although that would have to be vetted in consideration of its effect on battery life), multiple RAM expansion slots, and upgradable video support. Beauty. What do you think? Would there be a market for such a machine?